Yum…I can’t wait to eat the leftover soup!!! 1. Heat olive oil over medium heat in a medium sized soup pot and add onions and leeks (set aside 1/4 cup). Cook until tender and slightly translucent. 2. Add garlic for a couple of minutes, then spices, and broth. Bring to a boil and then add potatoes. Simmer for 20 minutes. 3. Add kale and simmer for another 10 minutes. 4. In a saute pan cook the italian sausage along with the remaining 1/4 cup of leeks until golden. Drain on paper towel and cover with foil to keep warm. 6. 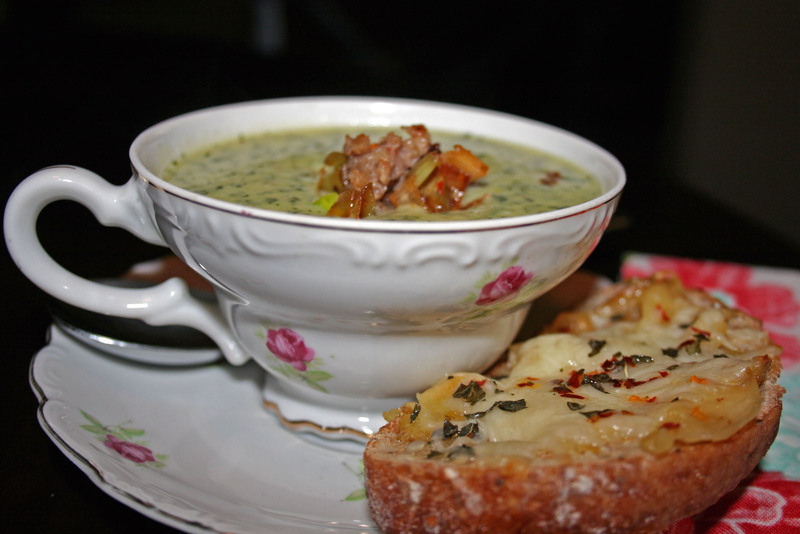 Ladle soup into soup bowls and garnish with the italian sausage and parmesan garlic toasts. 1. Cut off top of garlic head and drizzle with olive oil, wrap in foil and roast in the oven for about 30 minutes at 400°F. 2. Brush toasts with olive oil. 3. Remove garlic from foil and allow to cool. Once cooled enough to handle press the cloves out of the garlic and smash them into the bread toasts until evenly covered, about one clove per toast. 4. Add cheese, and sprinkle chili pepper flakes and dried basil. 5. Broil toasts a few minutes until edges are golden brown and cheese has melted. An apple a day keeps the doctor away! Homemade apple and potato soup with fresh thyme. 1. In a large saute pan combine leek, onion, apple, celery and olive oil over medium-low heat until tender, probably 15 minutes or so. 2. In a large soup pot combine milk and potatoes. Bring to a slow boil, careful to not scorch the milk and cook for about 20 minutes until the potatoes are tender. 3. While the potatoes are cooking add chicken broth, bay leaf and thyme to the apple mixture and simmer for about 20 minutes. 4. Remove the bay leaf and combine all ingredients in the large soup pot and use a Cuisinart Hand Blender to blend all the ingredients until smooth. You could also blend the soup in batches in your blender or food processor. Our Oster Blender does an awesome job with soups, but clean up is so much quicker with the Cuisinart, so inevitably the Cuisinart Hand Blender has been getting way more action lately. 5. You might need to add a little more chicken broth or milk to achieve desired consistency ours was pretty thick. Add salt and pepper to taste. 5. 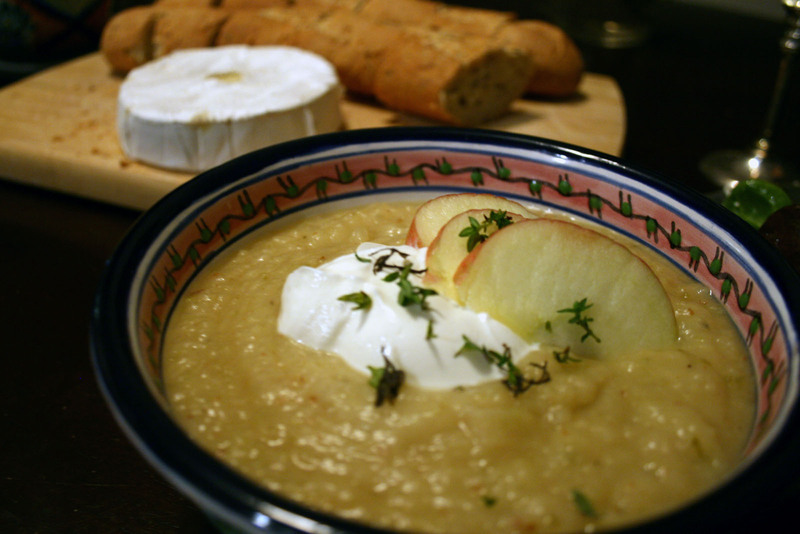 Ladle soup into bowls and garnish with a dollop of crème fraîche or sour cream, a couple of apple slices and a sprinkling of thyme. We served ours with baked brie, a whole wheat baguette and a dried cranberry, feta and candied pumpkin seed salad.